Mobile and GPS-based, user-friendly services to help private facility owners, ski resorts, municipalities and other organisations to gather information and communicate in real-time. Track4 Labs helps you work smarter instead of harder. Track4 is for everyone who loves to be outdoors. Track4 offers solutions to make your life easier. 360° Communication is the key to building effective relationships with customers, creating and fostering effective teams in a work place and increasing the efficiency of any organisation. Check out the Track4 Labs Products and Solutions to find out more about how you can improve your 360° communication capabilities. Quality and enjoyment go hand in hand and Track4 Labs allow users, both visitors and staff, to enjoy the best possible outdoor experiences. To learn more about how Track4 Labs can help you to deliver even better quality and value, look at the range of Products and Solutions provided by Track4 Labs. Track4 Labs allows you to know what is going on in your organisation at the touch of a button, whether it is checking tickets sales, reviewing maintenance tasks or learning from visitor feedback. To see how Track4 Labs can give you more control over your day to day routines, navigate over to the Track4 Labs Products and Solutiuons. Like the sound of things so far? Find out more about Track4 now! I want to create a web experience and an app that is simple and clear with functional web applications for recreation and experiences that will be complemented by a simple presentation app that is manageable. The municipality of Skövde are improving trail information for cross-country skiers in the vicinity of Billinge Leisure area and are also installing Track4Cross. The data-processing process is undergoing and we are estimating to be able to share trail information, webcamera footage options with weather information on both the municipalities' website and for the public mobilephone app Track4 as soon as the trails open for the season. The municipality of Kiruna are conveying that thanks to incredibly positive test results during the last season they are now choosing to fully implement the Track4Cross system for the season of 2013/14 on the 30km of groomed trails that municipality have prepared. Track4 Labs can impliment projects relating to many different types of tracking, ticketing and presentation. We can develop solutions in conjunction with your own experienced staff or let us provide you with a quote and we can take care of your project for you. Our Track4 Outdoors system is constantly being improved through the cooperation and feedback that we receive from our clients. Track4 Labs can also give prices for development project related to tracking, ticketing, task management and marketing using a combination of web and app based solutions. Skoterleder and the Benefits of Waiting. Skoterleder face an interesting problem: because Track4 Outdoors shows trail preparation in real time, scooter riders were able to immediately see which trails are getting prepared and go straight for those trails to ride on. The problem is that the snow needs some time to freeze and bind together otherwise the trails get torn up by the scooters and the quality decreases too rapidly. To solve this problem, Track4 Labs developed a special system so that trails can be prepared but the presentation of the trail delayed until the snow has had time to freeze over. The result was that Skoterleder were able to continue to present trail preparation of the highest caliber but also because of the delay maintain better trail quality as well. The benefit of this advancement was a better quality of service and less maintenance being needed for the trails, a win-win result. The delay feature is now available to everyone using Track4 Outdoors and gives more flexibility to present activities in a way that matches the reality of how you work and visitors use your facilities. 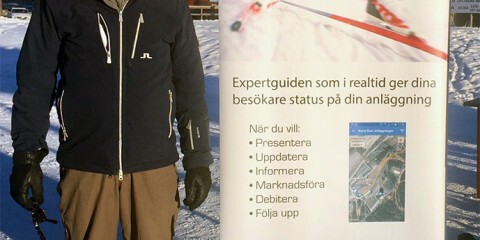 When Mora Kommun joined Track4 Outdoors in the Autumn of 2014 the asked Track4 Labs to help them by developing a ticketing system for their cross country skiing trails and other activities that they offer. They wanted people to be able to buy tickets in the Track4 Outdoors App and online as well as via Mora Kommun and the kommun’s resellers. Not only did Track4 Labs develop a system that works across all outlets and platforms, but was also able to develop the ability for one person to buy tickets and send them to different recipients via email or SMS. Furthermore, the system also incorporates verification management in both the online and Navigator App making it possible to offer a complete, end-to-end ticketing service. The system is extremely versatile with each customer able to build their own tickets to suit individual requirements. Thanks to this flexibility other customers are now able to use the Ticketing Service for selling everything from entry to sporting events to hunting and fishing licenses. Track4 Labs Vasalopps days Together with the municipality of Mora Track4 Labs during the November 11 to 12 participated at the Vasaloppet open days. Other participants were John Sport, SWIX, IFK Mora and Mad ..
Track4 Labs can now offer a fixed GPS solution that provides functionality with GPS update, WIFI, 4G and dual SIM card in a piste machine Although we always recommend that your staff are using a smartphone and our navigator app,we sometimes can identify that in a specific pistemachine it might be better to have a fix ..
Track4 Outdoors gets a new look for 2016! Track4 Outdoors has just received a facelift for 2016. The new look website and apps incorporate more pictures into the presentation of Trails, POIs and Zones making the system mor ..
Mora Kommun: Tickets Please! When Mora Kommun joined Track4 Outdoors in the autumn of 2014 the asked Track4 Labs to help them by developing a ticketing system for their cross country skiing trails and other ac ..
Funäsfjällen’s Skoterleder and the Benefits of Waiting. Funäsfjällen’s Skoterleder faced an interesting problem: because Track4 Outdoors shows trail preparation in real time, scooter riders were able to immediately see which trails are ..
Track4 Labs With both mobile and GPS-based user-friendly services, we help private facility owners, ski resorts, municipalities and other businesses to gather communicate information in real-time .